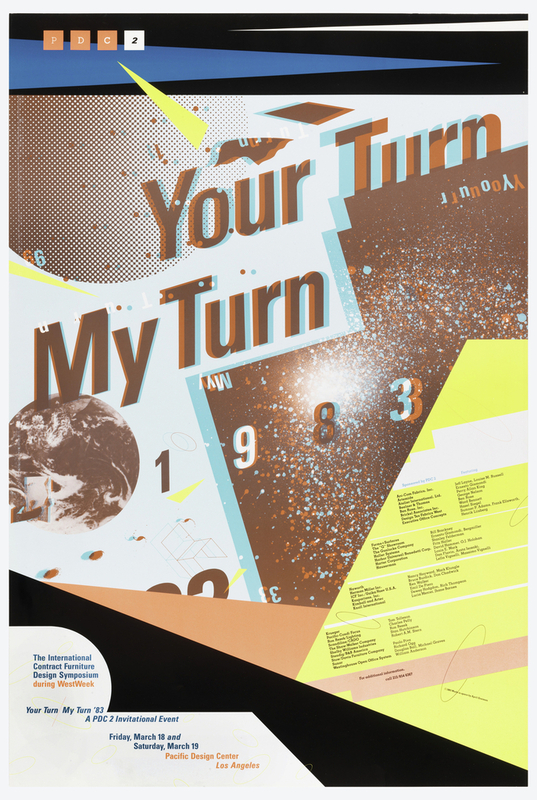 The idiosyncratic graphic designer April Greiman designed the poster Your Turn, My Turn for a 1983 symposium in Los Angeles, California. The conference aimed to discuss the roles of artists, designers, and architects within the field of design and possibilities for multidisciplinary collaboration. In deference to the conference’s ambitions, Greiman embraces innovation and freedom in her design by manipulating traditional forms with contemporary tools. Greiman began her career at the Kansas City Arts Institute, but her term at the Basel School of Design in 1970 largely shaped her design aesthetic. Prolific figures like Armin Hoffman and Wolfgang Weingart acquainted Greiman with postmodern typography and graphic language. These heretical perspectives disrupted the graphic design paradigm and indelibly altered Greiman’s visual style. The designer returned to the United States in 1971 and enrolled in graphic design and computer programming courses. While computer science was an unconventional course for a designer at the time, she was eager to experiment with emerging technological tools to create new graphic vocabularies. Greiman’s work further transformed when she moved to Los Angeles in 1976, where she discovered greater creative freedom. In 1982, she became director of the Visual Communications program at CalArts, where she gained access to the school’s electronic studios. Computers had not yet arrived at CalArts, but the institution provided Greiman with the newest video equipment for experimentation. Your Turn, My Turn demonstrates the designer’s obsession with digital imagery and print graphics through its unusual incorporation of 3D surfaces. Two-dimensionally, the poster’s vibrant neon hues and expressive composition evoke the immediacy of popular culture and psychedelic art that originated in California. The title and date of the conference are centered in the composition above a geometric shape with a celestial explosion enclosed. Illustrations of a planet, chair, and random shapes circle around the type, receding from view. Greiman uses a conventional sans serif typeface for the typography, but she creates a three-dimensional effect by printing two superimposed images of the text, one in cyan and the other in magenta. While the poster’s cut-and-paste aesthetic alludes to traditional collage, Greiman challenges design conventions by incorporating unstable layers, which spring from the surface when viewers wear the 3D glasses Greiman designed to accompany the poster. Greiman’s design presents a technically ambitious object that synthesizes optical tricks and conventionally fixed imagery, culminating in a multi-layered poster that allows the viewer many ways of engaging with the surface. Your Turn, My Turn offers a realm in which individuals can connect to the artist, the ideals of the symposium, and each other through its fusion of visual and experiential elements. John Dreyfuss, “A Design Conference Smorgasbord: Programs to Deal With Architectural Topics, Opinions CONFERENCE: Design, Architecture,” Los Angeles Times, March 19, 1982, sec. Part V.
 Rudy VanderLans, “Conversation with April Greiman,” Emigre, no. 14 (1990). April Greiman and Eric Martin, Hybrid Imagery, 45.